LeapStart is an interactive learning system that gets kids excited about counting, learning to read, problem solving and more through fun, replayable activities. 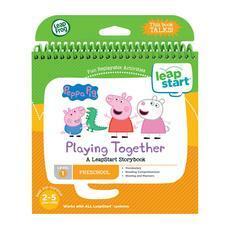 The magic behind LeapStart is a stylus that reads invisible dots on every page, triggering questions, challenges, songs, jokes and more. With more than 400 activities across a library of 25+ books (sold separately), LeapStart helps kids build tomorrow's skills today, in new imaginative ways. The magic behind LeapStart is a stylus that reads invisible dots on every page triggering questions, challenges, songs, jokes and more. The LeapStart library has more than 400 activities that include touch-and-talk games, creative challenges, problem-solving puzzles, math mazes and more with 30+ activities in every book (sold separately).